What’s the R represent in Contradict? The R contains an upside down Pentagram wrapped in a circle. It commonly represents Satanism. There is often an image of a Goat drawn into the star with the two up points forming the goat’s horns. This might be in reference to Matthew 25 where Jesus says that sheep go to heaven, and goats go to hell. I have heard that the five point star facing upward has been used to represent the wounds of Christ: his head, hands, and feet. It would then make sense for the Satanist to flip it upside down; I know they have down that with the cross, they flip the cross upside down. Whatever God does they do the opposite of, or the backwards of. Although the upside down cross has also been shown as a good thing in some Church history and tradition as representing the cross of Peter, who according to tradition was crucified upside down by his own request because he didn’t want to to die in the same manner as his Lord; he was unworthy of such a death. So, don’t always think the upside down cross MUST be Satanic. Though in our day and age, it almost always represents an antiChrist position, or attitude. But… the five pointed star has also been used to represent the five elements, common in many forms of paganism: earth, air, fire, wood, and spirit (I believe are the five elements). The pentagram facing upwards in a circle represents Wicca. Downwards is Satanism. Dig around my Youtube channel and you’ll find more videos that are Contradict themed that focus more on supporting the Christian message of salvation through faith in Christ alone! Thanks for getting a sticker and joining the movement. If you like the videos, you’ll love the book I wrote, Contradict – They Can’t All Be True. You can find links on the Contradict Movement page, and it’s on Amazon and Barnes’ websites. Eventually, I’ll have group discussion guides for all the symbols in addition to the videos, and then we’ll be rolling! For now, a few of the complete discussion guides are on the CM website at the bottom of the home page. Next Post The Blind Men and the Elephant – The Response! 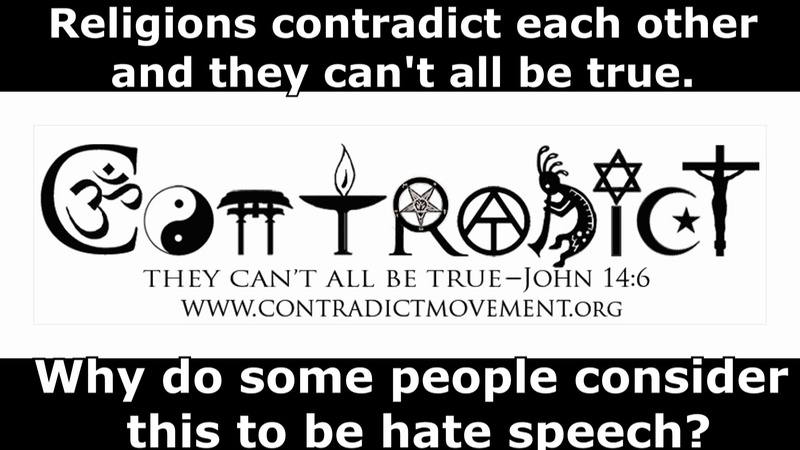 I always detested the “coexist” meme because it was so banal and meaningless, and the ‘contradict” meme makes a good contrast. I’m still weighing in my mind the best way to make effective use of it, because I don’t want to seem to set Christianity in opposition to everyone else, in the sense that “we oppose all your heathen religions and you’re all going to hell” but I do want to get the message “they can’t all be true” across effectively.